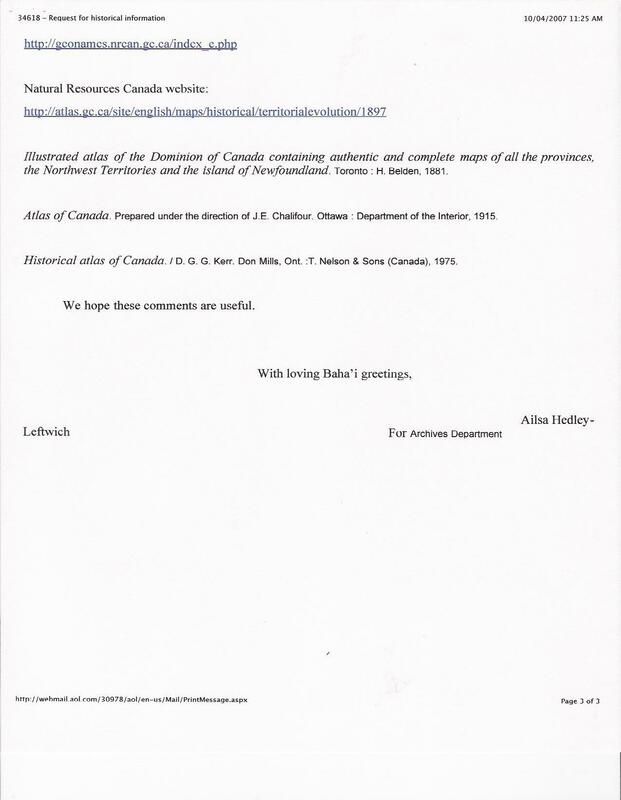 Question to, and response from, the Archives of the NSA of Canada about why 'Abdu'l-Bahá addressed these then-sparsely-populated regions of Canada. 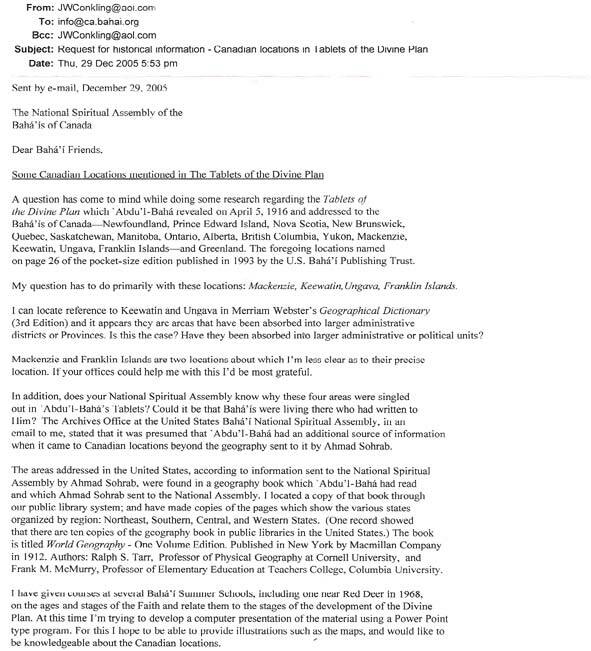 This letter was inspired by research into the maps consulted by 'Abdu'l-Bahá.. 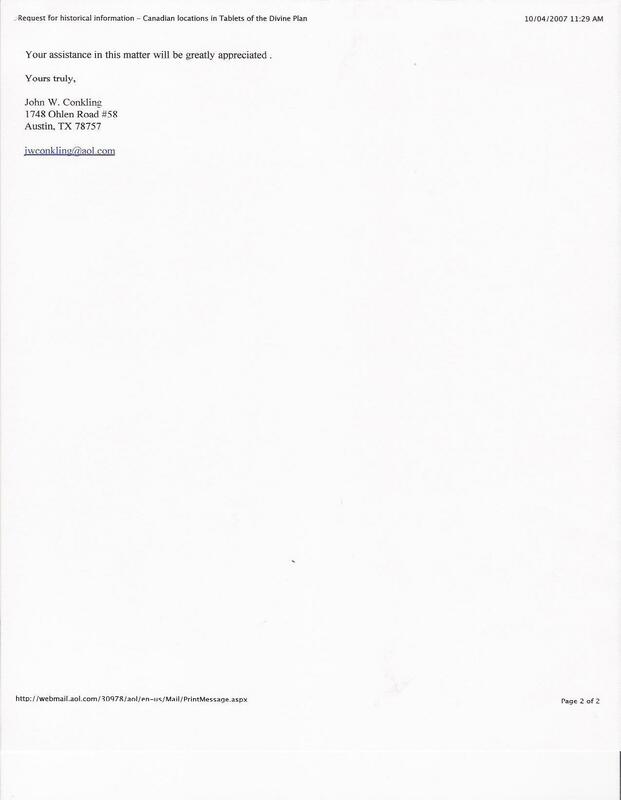 The following correspondence was scanned by the recipient (though sent by email, the emails themselves were lost and the recipient only has a paper copy) and later retyped. Both the original scans and the typed text are below. 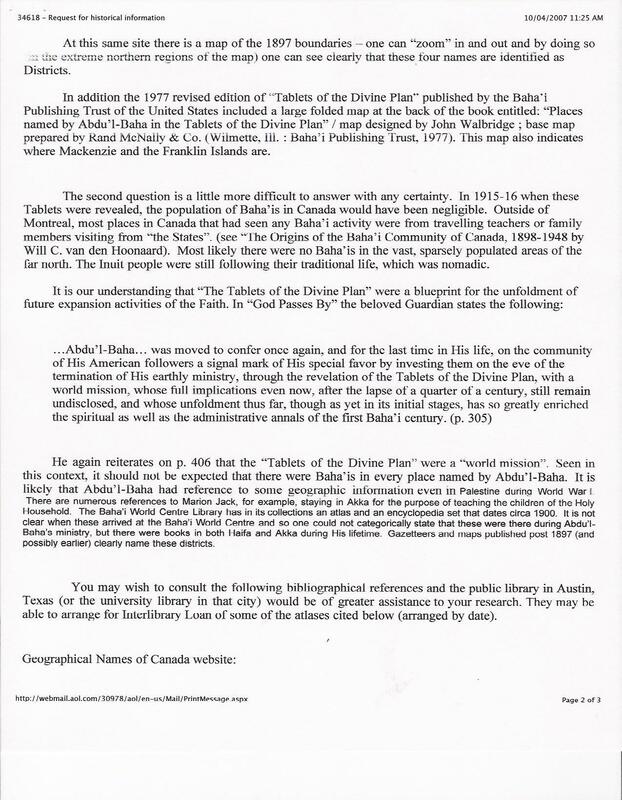 A question has come to mind while doing some research regarding the Tablets of the Divine Plan which `Abdu'l-Bahá revealed on April 5, 1916 and addressed to the Bahá'ís of Canada—Newfoundland, Prince Edward island, Nova Scotia, New Brunswick, Quebec, Saskatchewan, Manitoba, Ontario, Alberta, British Columbia, Yukon, Mackenzie, Keewatin, Ungava, Franklin Islands—and Greenland. The foregoing locations named on page 26 of the pocket-sized edition published in 1993 by the U.S. Bahá'í Publishing Trust. My question has to do primarily with these locations: Mackenzie, Keewatin, Ungava, Franklin Islands. I can locate reference to Keewatin and Ungava in Merriam Webster’s Geographical Dictionary (3rd Edition) and it appears they are areas that have been absorbed into larger administrative districts or Provinces. Is this the case? Have they been absorbed into larger administrative or political units? Mackenzie and Franklin Islands are two locations about which I’m less clear as to their precise location. If your offices could help me with this I’d be most grateful. In addition, does your National Spiritual Assembly know why these four areas were singled out in `Abdu'l-Bahá’s Tablets? Could it be that Bahá'ís were living there who had written to Him? 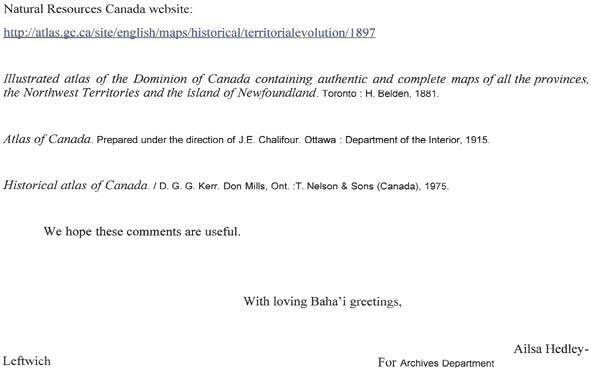 The Archives Office at the United States Bahá'í National Spiritual Assembly, in an email to me, stated that it was presumed that `Abdu'l-Bahá had an additional source of information when it came to Canadian locations beyond the geography sent to it by Ahmad Sohrab. 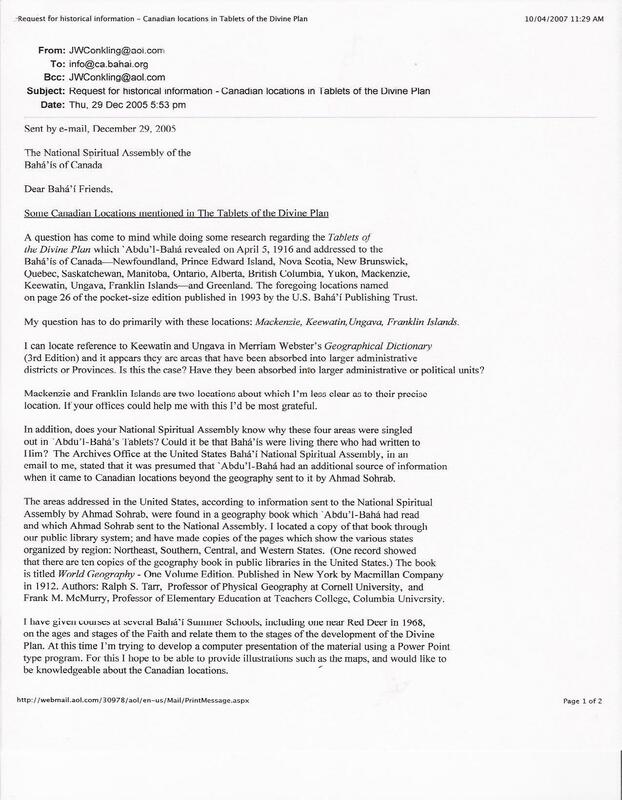 The areas addressed in the United States, according to information sent to the National Spiritual Assembly by Ahmad Sohrab, were found in a geography book which `Abdu'l-Bahá had read and which Ahmad Sohrab sent to the National Assembly. I located a copy of that book through our public library system; and have made copies of the pages which show the various states organized by region: Northeast, Southern, Central, and Western States. (One record showed that there are ten copies of the geography book in public libraries in the United States.) The book is titled World Geography – One Volume Edition. Published in New York by Macmillan Company in 1912. Authors: Ralph S. Tarr, Professor of Physical geography at Cornell University, and Frank M. McMurry, Professor of Elementary Education at Teachers College, Columbia University. I have given course at several Bahá'í Summer Schools, including one near Red Deer in 1968, on the ages and stages of the Faith and relate them to the stages of the development of the Divine Plan. At this time I’m trying to develop a computer presentation of the material using a Power Point type program. For this I hope to be able to provide illustrations such as the maps, and would like to be knowledgeable about the Canadian locations. 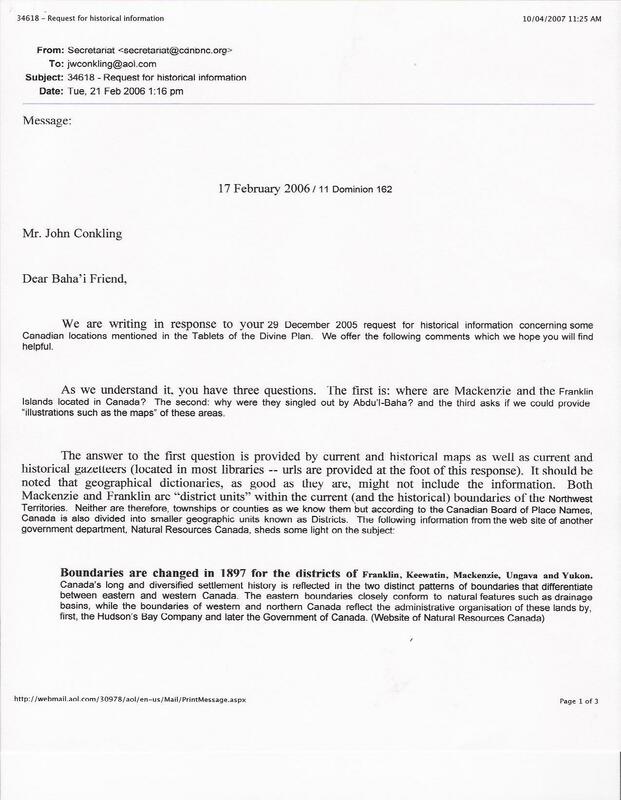 We are writing in response to your 29 December 2005 request for historical information concerning some Canadian locations mentioned in the Tablets of the Divine Plan. We offer the following comments which we hope you will find helpful. As we understand it, you have three questions. 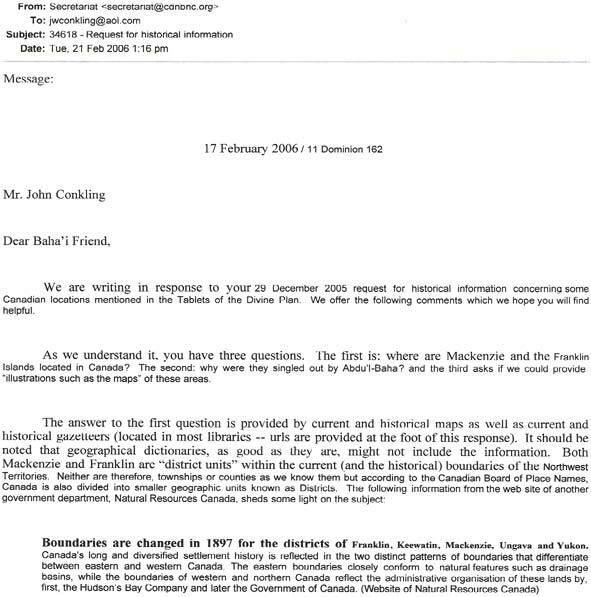 The first is: where are Mackenzie and the Franklin Islands located in Canada? The second: why were they singled out by `Abdu'l-Bahá? and the third asks if we could provide "illustrations such as the maps" of these areas. Boundaries are changed in 1897 for the districts of Franklin, Keewatin, Mackenzie, Ungava and Yukon. At this same site there is a map of the 1897 boundaries – one can "zoom" in and out and by doing so (in the extreme northern regions of the map) one can see clearly that these four names are identified as Districts. 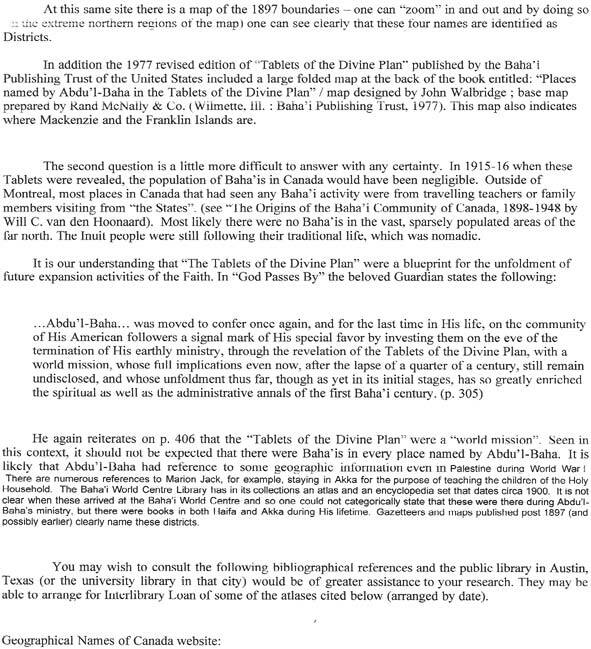 In addition the 1977 revised edition of "Tablets of the Divine Plan" published by the Bahá'í Publishing Trust of the United States included a large folded map at the back of the book entitled: "Places named by Abdu'l-Bahá in the Tablets of the Divine Plan" / map designed by John Walbridge ; base map prepared by Rand McNally & Co. (Wilmette, Ill. : Bahá'í Publishing Trust, 1977). This map also indicates where Mackenzie and the Franklin Islands are. The second question is a little more difficult to answer with any certainty. In 1915-16 when these Tablets were revealed, the population of Bahá'ís in Canada would have been negligible. Outside of Montreal, most places in Canada that had seen any Bahá'í activity were from travelling teachers or family members visiting from "the States". (see "The Origins of the Bahá'í Community of Canada, 1898-1948 by Will C. van den Hoonaard). Most likely there were no Bahá'ís in the vast, sparsely populated areas of the far north. The Inuit people were still following their traditional life, which was nomadic. He again reiterates on p. 406 that the "Tablets of the Divine Plan" were a "world mission". Seen in this context, it should not be expected that there were Baha’is in every place named by Abdu'l-Bahá. It is likely that Abdu'l-Bahá had reference to some geographic information even in Palestine during World War I. There are numerous references to Marion jack, for example, staying in Akka for the purpose of teaching the children of the Holy Household. The Baha’i World Centre Library has in its collections an atlas and an encyclopedia set that dates circa 1900. it is not clear when these arrived at the Baha’i World Centre and so one could not categorically state that these were there during Abdu'l-Bahá’s ministry, but there were books in both Haifa and Akka during His lifetime. Gazetteers and maps published post 1897 (and possibly earlier) clearly name these districts. You may wish to consult the following bibliographical references and the public library in Austin, Texas (or the university library in that city) would be of greater assistance to your research. They may be able to arrange for Interlibrary Loan of some of the atlases cited below (arranged by date). Illustrated atlas of the Dominion of Canada containing authentic and complete maps of all the provinces, the Northwest Territories and the island of Newfoundland. Toronto: H. Belden, 1881. Atlas of Canada. Prepared under the direction of J.E. Chalifour. Ottawa : Department of the Interior, 1915. Historical atlas of Canada. D. G. G. Kerr. Don Mills, Ont. : T. Nelson & Sons (Canada), 1975. We hope these comments are useful. Click on each image for a full-size scan.